I'm using MDR...which is literally skeleton MD3s. no skeletal control features and has very abridged skeletal structure (for the memory!!! ), also allowing for more polys and more frames. Worked on the railgun a bit today. Hopefully it is at a point where it can be useful to folks. Textures are still super rough. I projected Arne's paintover to the model, touched it up a bit, and baked it out on a set of uvs designed for handpainting. The geometry could probably use some tweaking, still trying to figure out the grip/slide. Left hand is clipping through, might be my fault for the bad incompatible animation rig. 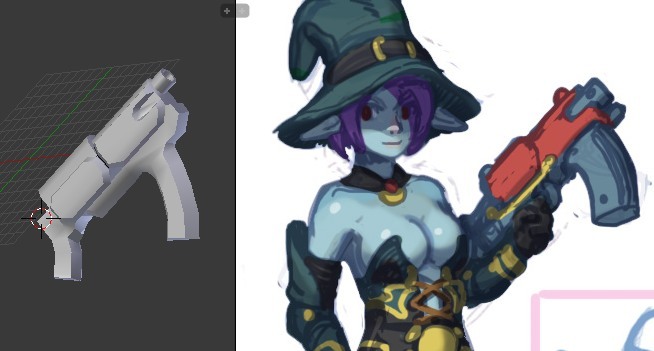 Also the skin was quickly resampled to 512x512 and had a dilate+ddilate+unsharpmask darken layer followed by a dilate+unsharpmask multiply layer or something like that, to compensate the texture for overbrights. That gun looks seriously awesome and way much better than the current one on OA. The character looks nice in shape, but the body feels too camouflaged while the head distracts. Unless some brightskin is included; perhaps a different colour than white and grey on the body could be used. Nice new character. I have been wanting to make a model, but I lack a lot of knowledge of how to use blender. I made a sketch of how the character would look, but the sketch only outlines the general idea and lacks proper proportion. I have not found out how to start a new topic yet, and it would be rude of me to intrude by adding my own sketch. 2) Click on "new topic" link: there is a line with "Mark Read | Notify | New Topic | Post new poll" on the right, at the beginning and at the ending of threads list. also, added little glow flare sprites, also on the same texture!!! All are rgbGen entity. Thanks for the help, Gig. For some reason I missed such an obvious thing, repeatedly. i'll probably scrap it and start over lowpoly first. Doesn't actually know who Vash is. Once had hair. 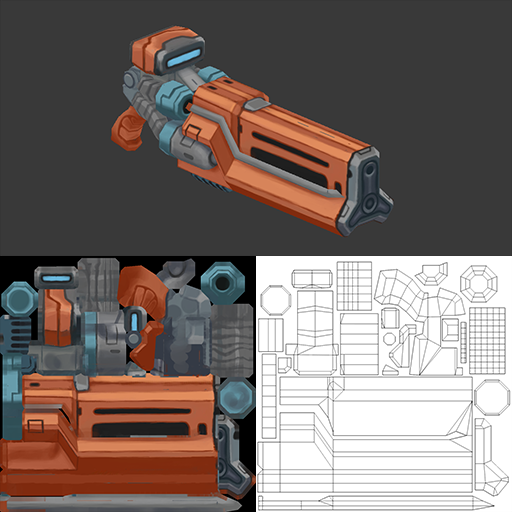 I think weapons are best made using subdivision, extrusion... and before that, planning. I'm hardly the right person to give advice about 3D modelling though, haha. Light-tube animation on railgun works pretty well! I thought my pantyladen thread had sunk to the bottom by now.